Are the Baltimore Orioles their favorite team? You've come to the right place for premium-quality personalized wall decor that celebrates both their devotion to their favorite MLB team — as well as their love for their family! 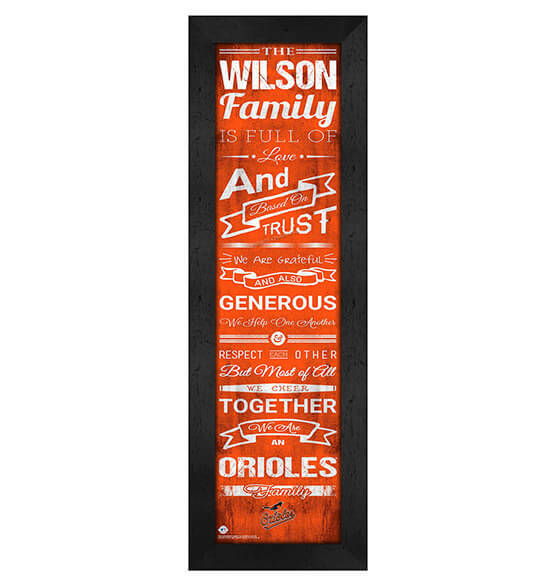 This easy-to-customize Personalized Family Cheer MDF vinyl-wrapped frame with premium paper and glass features heartwarming sayings that reflect their love for each other in vibrant Baltimore Orioles team colors. For natives of Charm City or those who have adopted the O's as their home team, you can't go wrong with Baltimore Orioles baseball gifts from PersonalizedThings by Exposures.